The best wooden privacy fence should be built with a cedar material and other quality materials ensuring a beautiful, lasting cedar privacy fence. 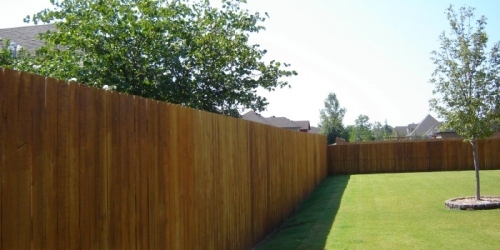 In the Oklahoma City, Edmond, Moore, and Norman areas, wooden privacy fences are the most popular fencing type to have installed. And, that's why we specialize in building strong, lasting wooden fences for our customers. 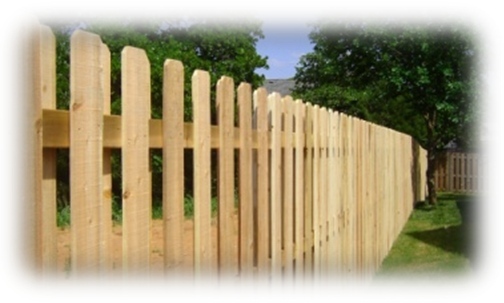 We use choice fencing materials. Some of the materials we use are high grade, solid 2"x4" cedar or redwood back rails to run along the back side of the wooden panel. The cedar back rails are thick, rough cut 2"x4"'s giving you lots of material for the money. The redwood 2"x4" are smooth on four sides (S4S), meaning that they are rounded at the edges, so when you run your hand over them you won't get splinters! Cheap privacy fence, with 2"x3" back rails, are low quality. They are bought pre-built from the home improvement centers having a much thinner wooden back rail than a 2"x4". These 2"x3"'s are much lower in quality than a solid 2"x4". These are not S4S, are much weaker, and more likely to sag in the middle. They also contain a ton of unsightly knots. The knots make the wooden pickets weaker and more likely to break in the future with normal wear and tear through the years. Installers also have a difficult time with knots when they need to rip a picket lengthwise. If there is a big knot in the middle, the integrity of the picket is compromised. We prefer not to install these pre-built panels. Rather, cedar wood is a very good choice for just about any need or situation. Cedar is a great looking wood, attractive for every residential application. Which includes around the pool area, garden, or even a shorter, decorative front yard fence. It also looks very attractive as a shadow box, or split rail type. A well built, attractive privacy fence will add to the value of your home and property. Most home buyers have pets and/or children and will be looking for houses with yards for their kids and pets to play safely in and also to have some privacy. And if you "blew in" from another state with the Oklahoma winds, six (6') foot high wooden fencing will help control wind gusting through your backyard and patio. To build a wooden privacy fence we only use galvanized nails to nail the wooden pickets to the back rails. Galvanized nails help prevent rust streaks from the nail running down your new pickets. The customer above freshly stained his cedar fencing after our installation. This is an 8' foot wooden fence with 4" wide pickets and four, 2"x4" cedar back rails joined to 6' foot privacy fencing along the far side. Have you considered asking your neighbor(s) if he or she would be interested in splitting the cost? Often they are willing to contribute to their share of the fence line.